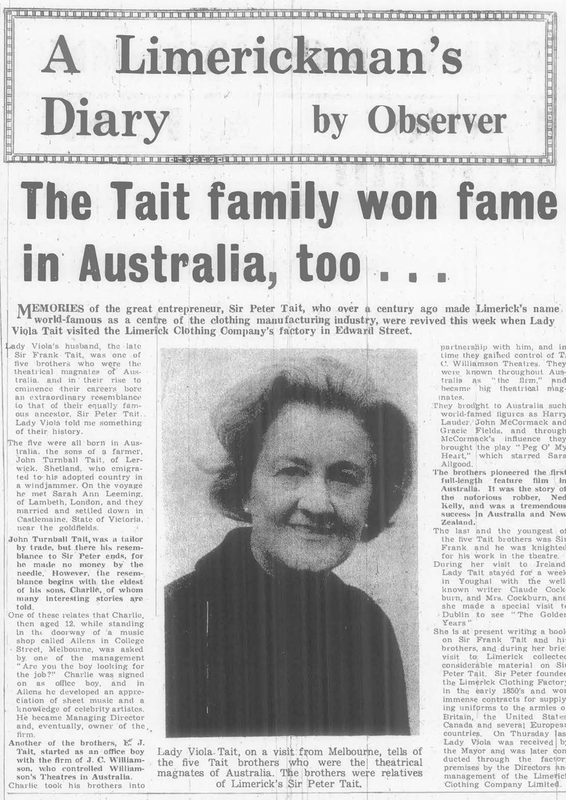 History of Tait House: Like many more from his native Shetland Islands in Scotland, before him and since Peter Tait was an immigrant at an early age. But he was much more than that. Born in Ierwick, Scotland, in 1823, the second son of Thomas Tait, he came to Limerick in 1838, with seven shillings and sixpence in his pocket. He had moved to the city to join his sister. 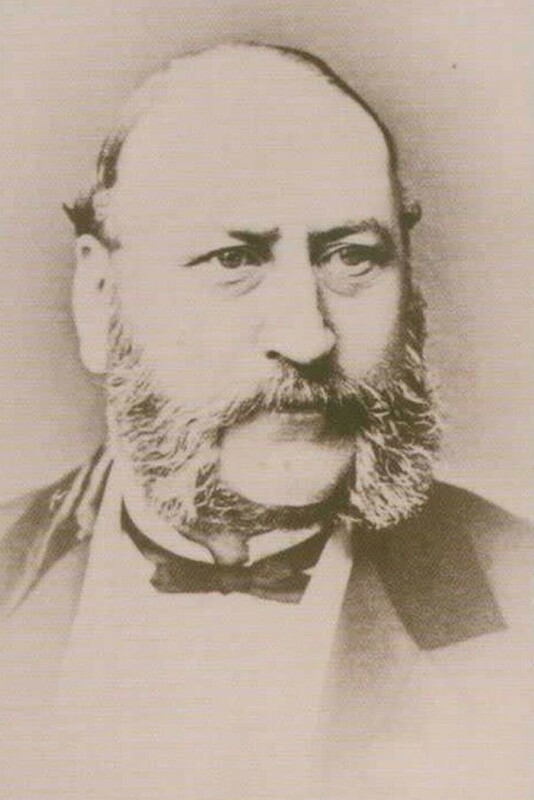 During his thirty years in the city, Peter Tait was to show remarkable business acumen and genius, which made him Limerick’s leading industrialist and Mayor for three successive years, from 1866 to 1868. 1844, he secured employment as a shop assistant in the department store of Crumine and Mitchell. During a recession in trade, Peter Tait was laid off work, but he did not allow this misfortune to daunt him, instead, he seized the opportunity to show the initiative and character, that was later to take him to the top of the Irish industrial World. He purchased a hawkers basket stocked it with wares, which he sold in the City, also to Sailing Ships, many from as far away as Australia. After long months at sea, the sailors were among the best customers, as they sought shirts, and other such items of clothing to wear on shore. Tait soon realised the potential of his expanding market, and it was not long before he rented rooms at the Bedford Row. He also became an employer by taking on woman workers to make shirts. 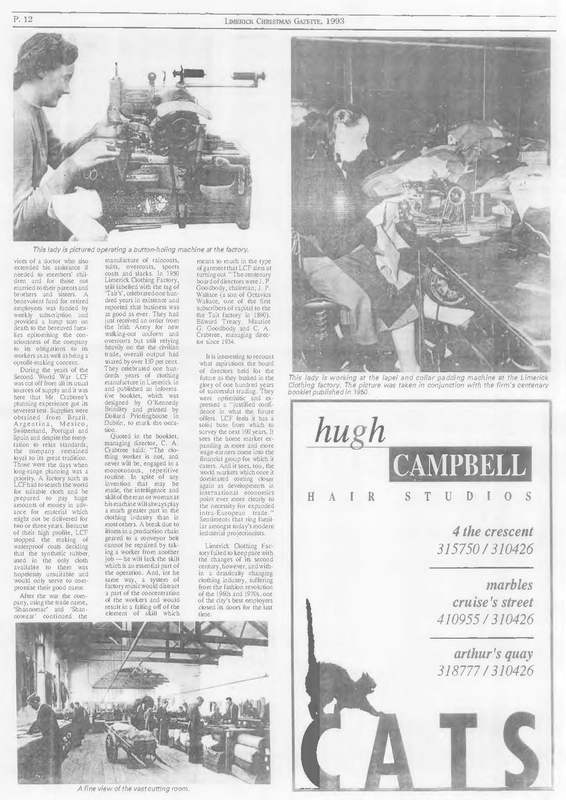 Three years later, he was advertising for 500 shirt makers and had moved to larger premises in William Street. On the 23rd June 1853, Tait married (Rose Abraham) of Fort Prospect Limerick at the (Independent Chapel,) Bedford Row. Rev. William Forbottom who was later to prove to be a valuable political supporter of Tait in the Orkney-Shetland General election campaign performed the ceremony. Peter Tait’s new-found social status and wealth were shown when he bought Tait House, an impressive mansion overlooking the city, and the couple took up residence there. Soon he was sanctioned as the official supplier of uniforms to the whole British Army. By 1858, Tait had become the biggest employer in Limerick, he had 1300 workers and 150 sewing machines. By 1864 he was established as the largest clothing manufacturer in the British Isles with his slogan (Prosperity to the Trade of Limerick) he continued to expand his operations. He entered politics and was elected Alderman for the Castle Ward. He was honoured at this time when a committee, comprising the main business people in the City, was set up with the object of erecting the Tait Testimonial in Baker Places a monument to all he had achieved for the people of Limerick. In 1868, Tait was further honoured by holding a Banquet. After his three years term as Mayor, Peter Tait gradually withdrew from Limerick. His business further declined and his driving energies were badly missed at the Limerick Clothing Factory. It was later to be re-opened under new management on the 16th November 1875. That year also marked the end of the Peter Tait era in Limerick. Little more was heard of him until his death at the Hotel de France, in Batoum in Russia on the 11th December 1890. He had gone there in pursuit of another new business venture. He had been trying to establish a Turkish cigarette Factory in Slavonic. He died almost penniless. He bequeathed his books-plates-furniture-and linen etc; to his wife Rose. He had no house to pass on, and he left only £50.00. 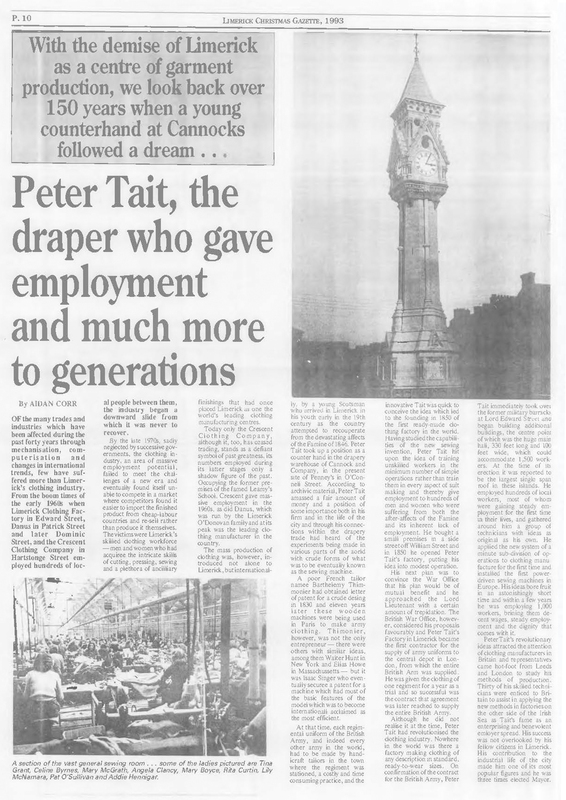 But a man of Peter Tait's stature was not easily forgotten by the people of Limerick. He was a firm believer of freedom of religion, he was renowned for his charitable nature, and contributed generously to all donations in the City. So after his departure from Limerick, a committee of business people was formed to erect a memorial to him. So a Magnificent Clock Tower was erected as a memorial to him in Glenworth Street, near the Dominican Church. 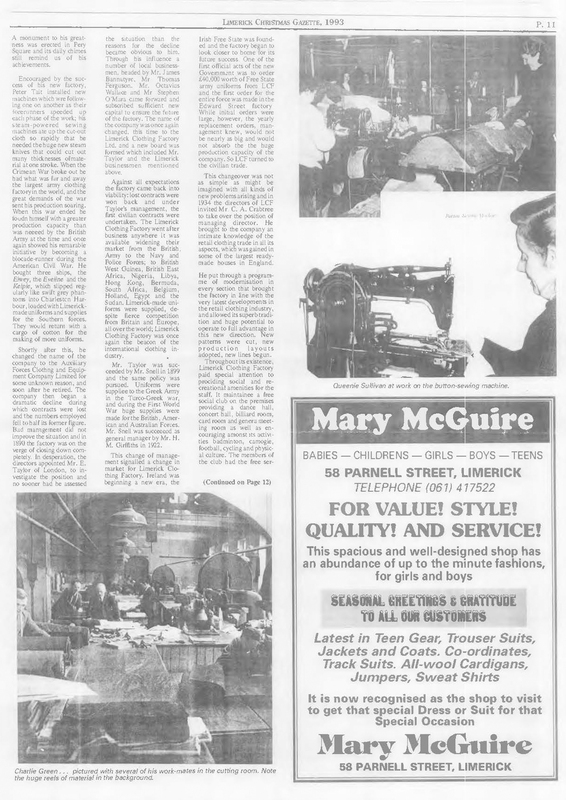 Also the Tait Business Centre, in Dominic Street, and The Limerick Clothing Factory at Edward Street. This was a fitting expression of the high esteem in which Peter Tait was held.